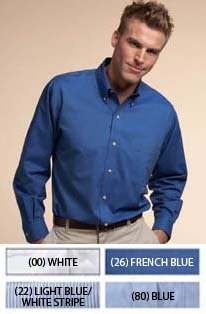 The executive oxford shirt is a non-iron and wrinkle free blend with a generous cut, adjustable cuffs. I features a back box pleat and double yoke, button down collar and a left chest pocket. Available in both short sleeve and long sleeve. Fabric Blend: 57/43 cotton/polyester Washing instructions: Home or industrial launder.